Merry Christmas to all people who usually come to visit this page. May Jesus come to your heart. 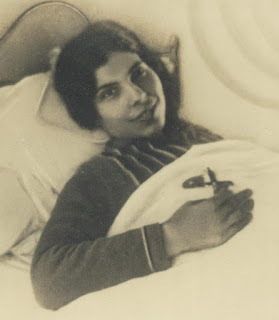 Between 1938 and 1942, Alexandrina relived, during ecstasy, the Passion of Jesus with accompanying actions which enabled the few people in her room to follow the order of events during that most painful way of the cross in its brutal cruelty; but it constituted a guarantee that the request for the Consecration of the World to the Immaculate Heart of Mary was of divine origin. On March 27, 1942, she suffered the Passion in form of physical participation for the last time. The following Friday, April 3, Good Friday, she did not again suffer the Passion externally but relived it in her heart. - Fear not, my daughter, you are no longer nailed to a cross. The crucifixion that you now experience is the most painful that can be imagined in history (SoS, 03/04/1942). Alexandrina reliving the Passion: contemporary painting. Sentiments of the Soul, Alexandrina’s largest work, is a kind of diary. When Churchill said that before the Battle of Alamein (Egypt in 1943) the Allies had achieved no victory, and after Alamein had suffered no defeat, it is not difficult to believe that the Consecration was decisive in hastening the end of the War. This suggests that a memorial should be built in Balasar to commemorate the Consecration. - I command you to tell your spiritual director, in proof of the love that you dedicate to my Blessed Mother, that each year I want a Consecration Act of the entire world made... just as I asked St. Margaret Mary to consecrate the world to my Divine Heart (LtFP, 08/01/35). - My daughter, I have chosen you for more sublime things! I have chosen you to inform the Pope of the desire I have for the world to be consecrated to my Blessed Mother (LtFP, 11/01/37). Pope Pius XII proclaiming the World Consecration to the Immaculate Heart of Mary on October 31, 1942. 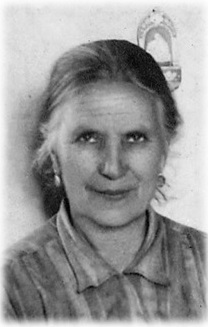 In 1936, she started to apply to the hierarchy for the Consecration. In 1938, began the experience of living the Passion externally. 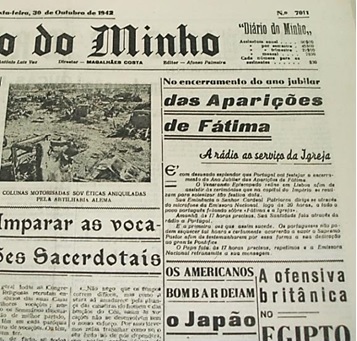 In 1941, Padre Terças published an account of the Passion experience which revealed Alexandrina’s name to the public, a disclosure altogether contrary to her wishes. In 1942, she began the fast and complete anuria, which would last until death. The year also saw the withdrawal of her beloved spiritual Director, Fr. Mariano Pinho. Page fragment of the newspaper edited by the Diocese of Braga on the eve of the Consecration of the world to the Immaculate Heart of Mary. 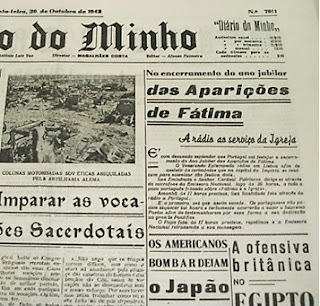 At the top, right, it mentions the Fatima Apparitions, at bottom and at the top left presents news of World War. In 1935, Jesus asked Alexandrina for the World to be consecrated to the Immaculate Heart of Mary, which didn’t take place until seven years later, on 31 October 1942, in the midst of World War II. During these years a lot had taken place in the world, and also in the life of Alexandrina. In Portugal, living under the authoritarian regime of Salazar was better than under tyrannical regime of the Republicans which remained in force from 1910 to 1926. In Spain, the Republican carnage had been brewing for years; and between 1936 and 1939, the country saw the horrors of civil war. Italy was dominated by the fascism of Mussolini. In Germany, Hitler was preparing to plunge the world into world war. At the head of Russia was Stalin, one of the grossest political aberrations of all time. In 1939, the WW2 started, in which the US participated after late 1941 (Pearl Harbour). Spanish Republican revolutionaries shoot the statue of the Sacred Heart of Jesus. Alexandrina spend 30 years in bed. In the beginning she nurtured the hope of being healed, asking Our Lady of Fatima who appeared at the Cova de Iria ten years before; but what she received was a love of suffering. In the meantime Jesus called her to his school and she found that the guiding motto of her life would be to suffer, to love, to make reparation. Jesus invited her to his crucifixion and she accepted the offer boldly, without hesitation. Jesus then led her to the highest summits of the mystical life and made her the loftiest promises for her role in the world and in the Church. - Give me your hands, that I want to crucify; give me your feet, that I want to nail with mine; give me your heart, that want to pierce with a spear, as mine was pierced. Consecrate me your whole body; offer yourself all to me! - Give me your blood for the sins of the world. Help me in my rescue mission. Without me you can do nothing; with me ye shall have power to save sinners and many, many things (LtFP, 03/01/35). Letters to Fr Pinho. Fr Mariano Pinho was Alexandrina’s first spiritual director. HONOR AND GLORY TO THE LORD IN THE HIGH HEAVENS! And the day of all those who are really devotees of the dear heavenly Mother! More beautiful and pure than the Angels! He created you so that you could be his Mother. Oh, how beautiful and immaculate You are! In You there is no stain of sin! The Queen of Heaven and Earth! Heavenly Mother, I am yours, make me pure! On Holy Saturday 1918, the day she was fourteen, Lino Ferreira, along with two Brazilian emigrants visiting their families, forced entrance to the room where she, Deolinda and another young woman were, intent on criminal purposes. To escape them, Alexandrina jumped from a window. That heroic twelve foot leap affected her spine and came to confine her in bed from 1925 till her death. Alexandrina jumped from the window of her house. After returning to Balasar, Alexandrina was soon living in an area called Calvary, in a small house that her mother had inherited. At the age of twelve, she worked for a while at the house of a neighbour, Lino Ferreira, who wished to seduce her, but she rejected his advances. Alexandrina was by this time a catechist and a singer in the church. She was very active in the practice of charity, without losing the qualities of playful girl and proud of her physical vigour. As in Balasar there was no school for girls, Deolinda and Alexandrina were sent to study in Póvoa de Varzim. Alexandrina confesses she learned little. 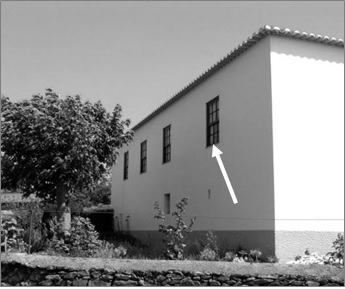 But her schooldays in Póvoa showed her that the urban life of a small town was very different from her rural parish. It allowed her also to experience the sea and to see the Church was under Republican persecution. It was during this period that she made ​​her First Communion and Confirmation. Main altar of the church of Povoa de Varzim where Alexandrina made her First Communion. Alexandrina was a healthy child, vigorous, playful, with zest for work and with poetic sensibility. She spent her childhood in the countryside, in the hamlet Gresufes, getting a deeply Christian education. Alexandrina was born in a cold day of March in front of this fireplace. The parents of Blessed Alexandrina Maria da Costa were Maria Ana da Costa and António Xavier. They were neighbours, but unmarried. António Xavier was an emigrant in Brazil. Once he came back to Balasar and Deolinda was conceived; later he went again to Brazil. In a second coming, was conceived Alexandrina. 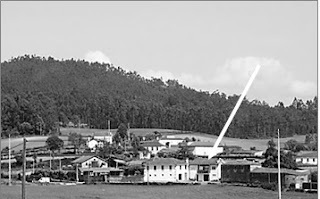 But even before her birth the unworthy father António married a girl from Póvoa de Varzim. Faced with this situation, the young mother saw herself as a widow and started caring only for the maintenance and education of her daughters. She became an active, exemplary and prayerful woman. She suffered much, but Jesus promised Alexandrina he would take her mother to Heaven without her having to pass through Purgatory. D. Ana, mother of Bld Alexandrina. The arrow indicates the house where Alexandrina was born at Gresufes. Although there are several biographies published in English on Blessed Alexandrina, this brief biographical sketch was written to fill a specific need. It is based mainly on the works of Signoriles, an Italian couple who wrote extensively on Alexandrina. I thank the collaboration Leo Madigan, who translated it. We were yesterday at Balasar where we saw some sisters of the Congregation of the Holy Cross. Knowing the importance of the Holy Cross appeared at Balasar and the continued martyrdom of Blessed Alexandrina it makes perfect sense the interest of the community on this Beata. "The Canticle of the Cross can be sung with the Angels only by those who truly love the Cross." We enjoy the message we put here on the 13th October: good singer Alexandrina would soon sing hymns to the glory of God. Holy, Holy, Holy, Lord God of hosts! Heaven and earth are full of your glory! Blessed is he who comes in the name of the Lord! This way of conceiving eternal life, because it is also it, is much more motivating than the "eternal rest among the splendors of everlasting light." Who will sing with the Angels? 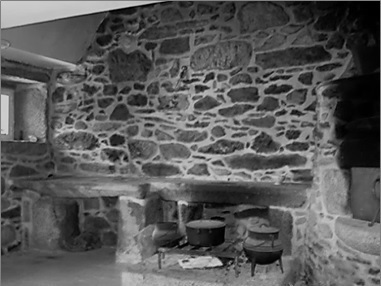 In the beginning of October 1955, few days before her death, Alexandrina hears the announcement of her departure. - You, you, you, soon, soon, soon! If the last number of the Bulletin of Graces seemed to be below its usual level, this improved frankly. Beyond the Repair, major theme of the Beata message, we highlight the news, by Maria Rita Scrimieri, of an eloquent testimony of a few Filipino pilgrims. Charming. 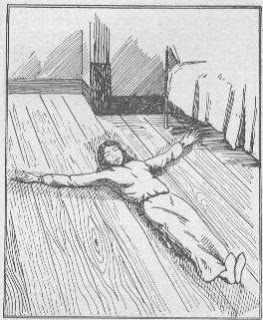 We liked also to see the illustrated news of the death of D. Eugenia Signorile, the testimony of a former Alexandrina’s visitor and writing on Fr. Leopoldino with the announcement of a lecture on this former parish priest of Balasar. In conclusion, comes one call for people to lend the responsible for the Cause any writings by Alexandrina that they may have. ALEXANDRINA, I WANT TO LEARN FROM YOU! On this Earth, whoever loves suffers. But those who suffer do not always knows how to love! And pain without love, at times incomprehensible, leads to desperation. The true Christian learns to put up with pain for love’s sake. He has Faith in the saving power of his pain when it is offered in union with the sufferings of Christ, who continues the Redemption throughout the centuries by means of the sufferings of His members. Let us remember that in Fatima Our Lady invited the three little Shepherds to suffer for the salvation of the souls. And with what an impetus of love the children corresponded! As soon as a man takes up his cross, uniting himself spiritually to the cross of Christ, the salvific sense of suffering is revealed to him. The man does not discover this sense on a human level, but on the level of the suffering of Christ. But at the same time, from this level of Christ, that salvific sense of suffering descends to the level of the man and becomes, in some way, his personal reply. And then the man finds in his suffering interior peace and finally spiritual joy. We must understand that these words were not written by one speaking abstractly of the Christian value of suffering, without having experienced it! This encyclical letter was written in 1984, after John Paul II, having lived through the attempt on his life in 1981, was beset by many other sufferings arising from his roll of Head of the Catholic Church. The love of the cross has been always a distinctive sign of elect souls. Our seraphic Father (St Francis) well understood that without the love of the cross there can be little advance in the way of Christian perfection. Jesus waits with opened arms to receive me: He waits for me full of smiles and love. Jesus asks for the love of all hearts with intense ardour. Jesus has His divine Heart in flames: it burns, burns continuously for us. How great is the love of Jesus and how great is the ingratitude of souls! Oh, if I could open my heart and show the world the tenderness of divine love! I experienced in myself a sense of love (Alexandrina relives the sentiments of Jesus and of humanity) and of very strong ingratitude. The love was an immense love: it filled the heavens and the earth; the ingratitude was so great and so deep-seated. It was opposed to this love, a love that sailed over everything like a firm small and sure boat. Jesus infused in your heart the burning fire of His divine Heart: it is a fire that loves, it is a fire that consumes. The soul that loves radiates love and allows to be transparent around itself the strength of its love. Fire, when it ignites, always leaves evidence that it has burnt. Come to Me all you that suffer and enter into my divine Heart. Come to Me all you who yearn to love Me and drink from this fountain that never runs dry! I am love, love, infinite love and eternal love. Come, come to Me all of you, console my divine Heart! Say me continuously that you love Me and ask Me constantly for my love. My divine Heart wants to give Itself, to give Itself, It wants to fly to all hearts. O world, o souls, how Jesus loves us! Let us love Him in return! His was an infinite pain, it was the pain of a God become man. Let us love Him without stopping, let us love Him night and day! Let us accept Alexandrina’s invitation! You love me in pain and in joy. You love me in silence or speaking. You love me in everything. One who is far from the tabernacle is far from heaven, far from Jesus. I want souls, many truly eucharistic souls. The tabernacle, the tabernacle, oh, if the tabernacle was fully understood! The tabernacle is life, the tabernacle is love, the tabernacle is joy and the peace. I chose you as a victim so that you might continue my work of redemption. I put love in your heart, unquestioning love for the Eucharistic. It is through you, it is with the light of this fire that you light many souls. Guided by this star which has been chosen by Me, and transported by means of your example, the light will be transformed into burning souls, truly eucharistic souls. Poor world, without the Eucharistic! Poor world, without my victims, without the hosts continuously immolated with Me! I thank You, Eternal Father, for having left Jesus to me in the Blessed Sacrament. I thank You, my Jesus, and finally ask for Your holy blessing! I am always keeping Him company and often receiving Him spiritually; as the hours pass, how many times do I receive Him! My insatiable love is the Eucharist. C (01.10.40). O my beloved Jesus, I join myself in spirit, at this moment and from this moment forever, to all the holy Hosts of the earth, in each place where you live sacramentally. There I want to pass all moments of my life, constantly, day and night, glad or sad, alone or followed, always consoling You, loving You, praising You and glorifying You. A (p.30). Tell souls that love Me to live close to Me during their work. I adore You in all the places where You live in the Blessed Sacrament of the Altar. I love You in place of those who do not love You. I make reparation for those who offend You. Come into my heart”.These will be moments of great joy and consolation for Me. How many crimes are committed against Me in the Eucharistic! S (02-10-48). Holy Mass has begun. All the time I had to force myself not to leave my bed. I seemed to be all immersed in Jesus as I contemplated with joy the sacred Hosts that were on the altar. What a joy: one of them would be food for my soul! C (30-05-41). What a great grace! He came down from Heaven to earth for my love! At the moment of receiving Him, I felt impulse to abandon myself to the sacred Host, to hug it, to devour it. C (31-10-41). When the Holy Sacrifice of the Mass was being celebrated, my soul experienced a peace, a well-being, a sweetness. I offered myself to Jesus, through the hands of the Heavenly Mother, to be immolated with Him. C (30-10-40). At the elevation I felt an impulse to raise myself and to fly to the Jesus-Host. I controlled myself and waited for the moment in which He came to me. (...) C (30-10-40). This morning, when I was preparing myself to receive my Jesus, I felt in my soul a so great emptiness that the entire world would be unable to fill. I was hungry: I wanted to fill myself. But my hunger was not for bread nor for things of this earth: my heart yearned and longed for Jesus. S (07-02-48). This morning I had made my preparation to receive Jesus, and my parish priest arrived. He placed the Longed-For One of my soul on the table,. After lighting the candles, he said to me: - Here you have Our Lord to keep you company for a little while. Fr Umberto will come later and give Him to you (Fr Leopoldino had to leave urgently). As soon as he left, a force coming from I know not where, compelled me to rise (she was paralyzed, but, when she relived the Passion she left her bed and made the movements of one carrying the Cross. However, after 1942 she relived the Passion interiorly which was very painful, but precluded her rising from the bed. (Here we are in 1944).I knelt before Jesus, I leaned on Him: my face and my heart never had been so close to Him before. What happiness I felt! To enjoy so closely my overpowering love! I whispered many things to Him, requests for all those who are dear to me, and for the entire world. - Love, love, love, my daughter! Have no other concern but to love Me and give Me souls. Where God is, is everything: there is the triumph, there is the victory. I asked the angels to come to praise and to sing to Jesus with me; I always sang, until I was obliged by Rev. Father to go to my bed. What a night, what a holy night! The greatest of all nights. I saw sweet Jesus blessing the bread that would become our Eucharist. S (11-04-47). (I saw Jesus) with His eyes fixed on Heaven, and His Face inflamed in such a way that He seemed to have in Himself the life of Heaven rather than our earthly life. He did not seem to be man, but only God: love, only love! S (30-04-48). It was such a light, such a love that encompassed all: Jesus, the apostles and me. S (15-11-46). And, at that moment of unparalleled love and wonder, I felt that I was in another world: Jesus gave Himself in food: he had left for Heaven and He stayed there. That love was extended to all humanity. S (02-08-46). How much Jesus loved! How much He loves! His desire is that we live through Him and for Him. S (20-05-49). My daughter, my dear spouse, tell souls that I wish to be loved and consoled, and that I desire reparation to be made to Me in the Eucharist. In my name tell all those who receive Holy Communion with sincerity and humility, fervour and love, for six consecutive first Thursdays, and pass one hour of worship, uniting their soul with Me before the tabernacle, that I promise Heaven. This is to honour my holy Wounds through the Eucharist, primarily that of my sacred shoulder so little remembered. Those who do this, who unite the pains of my Blessed Mother to the holy Wounds, and in their name ask for graces, be they spiritual or corporal, I promise to grant all requests if they are not a danger to their souls. At the moment of the death I will come to defend them, and bring my Blessed Mother with Me. S (25-02-49). In the following fragments Alexandrina tries to describe what she experienced, as soon as she received the One so longed for. The feelings are diverse according to the moment, her situation at the time, and the will of Jesus. Some can help us as examples, when we find ourselves in similar situations, others as a consolation. After Holy Communion, I felt a great union with the Lord and, later, a strong heat and a force that enveloped me. Thus I passed some moments and finally our Lord spoke to me:“I come to you so that you will unite your whole self to Me. Why are you so pusillanimous?” C (25-06-35). This day started very grievously for me. When I received Jesus, my pain was alleviated, the sadness disappeared. C (02-11-40). At the end of Holy Communion, how well I felt with Our Lord! What a great union! How comforting is your peace! How comforting it is to love You! And thus I passed some time with my Jesus. C (18-07-35). The way as I received Him today causes me sadness and pain. I soon forgot His divine visit. I do not have love for Him! C (29-09-40). I received Jesus with ice, an ice that freezes everything! My heart and my soul twist and untwist with affliction. C (28-12-39). I felt Jesus flooding my soul with His real presence, giving me the strength during the afternoon to walk, to sing and to pray. C (02-05-41). Jesus came at last, lowered Himself to my poor and unworthy heart, and soon made me feel that it was He. He filled me; my heart became so great! It seemed not to fit in my chest: I was as if I had in me the entire vault of the Sky. S (06-09-47). The holy Guest entered without looking at so much misery and indifference. He did not turn back, He entered my heart. Moments later, I was transformed: Heaven inclined towards me, it became united to the Earth, it absorbed me into itself. My soul was illuminated: I was great, great like God. “My daughter, my daughter, you are plunged, absorbed in the love of Jesus”. S (04-08-51). “O Father, may the participation in Your Sacrament insert us as living members in the Christ, Your Son, so that we are transformed into the One we receive”. (Prayer after the Sacred Communion, in St. Augustine’s Mass). My Jesus came. As soon as He entered into me, He dispelled the darkness: all my interior was illuminated with His love, with His peace. I was someone else. Now I could surely say: “It not me who lives, but surely Jesus.” S (01-03-47). Let us remember the well-known statement of St Paul: “It is no more I who live, but Christ who lives in me.” (Gal 2,20). Let us conclude with two excerpts as evidence that not only the soul longs for union with the Beloved, but that even Jesus experiences love’s anxieties and longs to be united to His creature, to possess it’s soul entirely. Once the Eucharist had been taken to her unexpectedly. The joy that I felt is unutterable, and at the same time, confusion. Joy at the arrival of the Longed for One in my soul and confusion over so many gifts received.How good is Jesus! He does not refuse to come to my nothingness, to my misery! “My daughter, my daughter, I cannot live without the dwelling of your heart. It is true that I live always in you, but now I come in a greater reality, in body and Spirit.” C (12-09-41). “What a love, what a love, what an excess of love, what a prodigy of love I have towards you, my daughter! You were panting to have Me in your heart, and I was longing to possess you completely”. C (12-09-41). Sou professor aposentado do ensino secundário e escritor.